Simple roasted butternut squash with just a little oil and cinnamon. The perfect healthy side, packed with nutrients. to add to your Fall dinners. Butternut Squash is another staple making it into our meal planning lately. I used to be very intimidated by those “other” squashes in the produce department. By “other” I mean anything other than your basic yellow summer squash. I know it is silly but I had never ever had them growing up and I honestly didn’t know what to do with them. All that changed when I went to a restaurant with my husband in Maine years ago and I ordered it as a side. Mashed butternut squash with cinnamon and brown sugar (and of course butter) I remember our waitress telling me that it was SO delicious and I would definitely not be disappointed. I fell in love with it that day! Now I made roasted butternut squash a whole lot. It’s kiss simple to prepare and it’s amazingly healthy too with vitamins A and C and potassium! 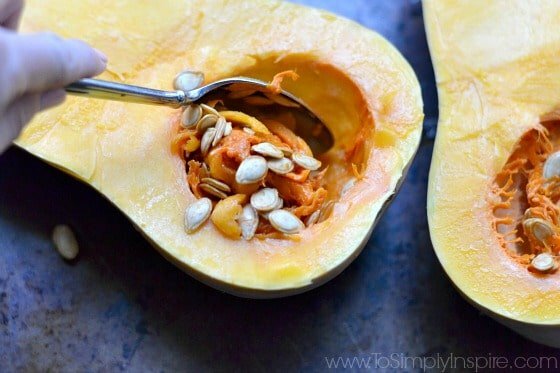 It is one of the sweetest squashes in my opinion so I don’t even add any brown sugar anymore. (but feel free of course if you’d like). Just a little coconut oil and a few sprinkles of cinnamon and a dab of maple syrup is my favorite way. And if you have never tried butternut squash soup, oh it’s a must! 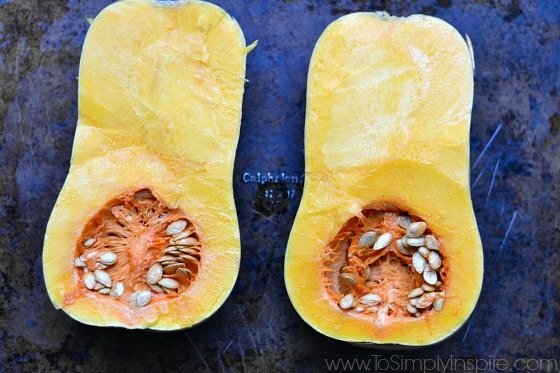 Below are directions for roasting the squash in the skin but you can also peel with it a standard vegetable peeler (this Y-peeler is my favorite), cut into 1 inch chucks, toss with a little oil and pepper and roast that way as well. 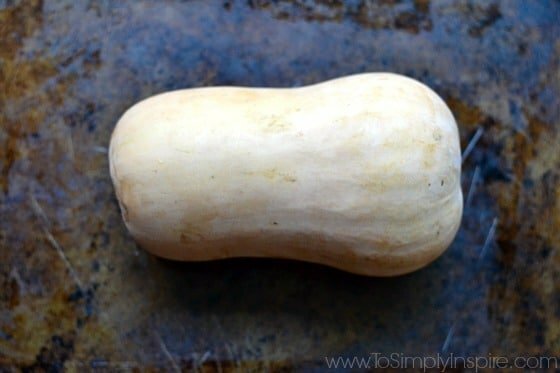 Cut the butternut squash down the middle the long way. Scoop out the seeds and the pulp with a spoon. 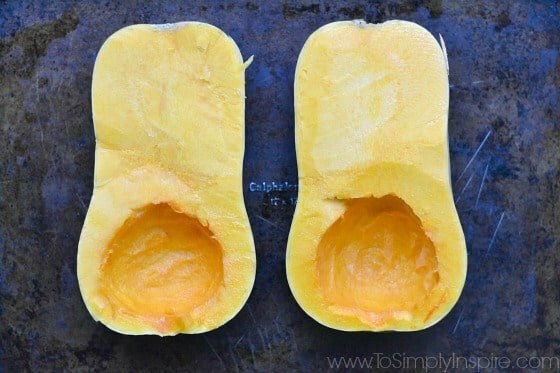 Place butternut squash halves on a large baking sheet with the cut side up. 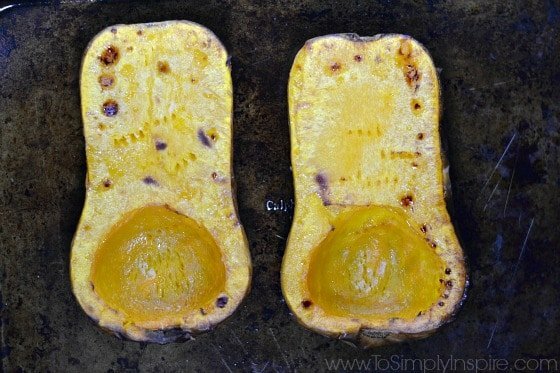 Rub the flesh of each side with 1/2 teaspoon of melted coconut oil, olive oil or butter in the middle of each squash. Remove from oven and sprinkle with a little cinnamon and 1 tablespoon of maple syrup on each half. 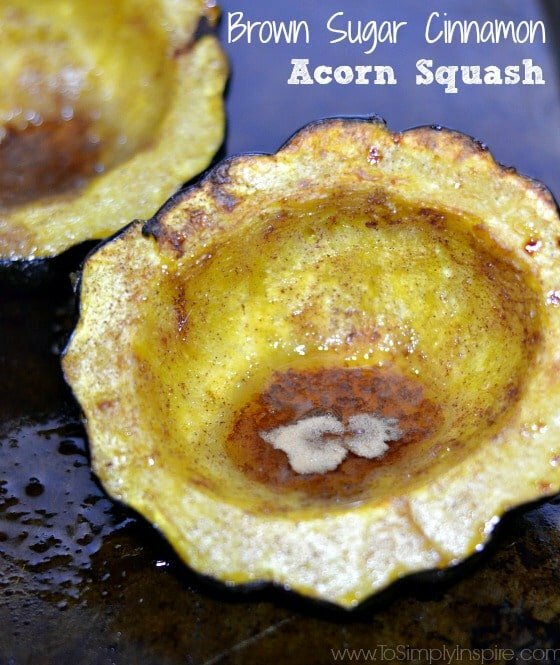 OMG this is a great way to prepare squash. I honestly haven’t tried this. 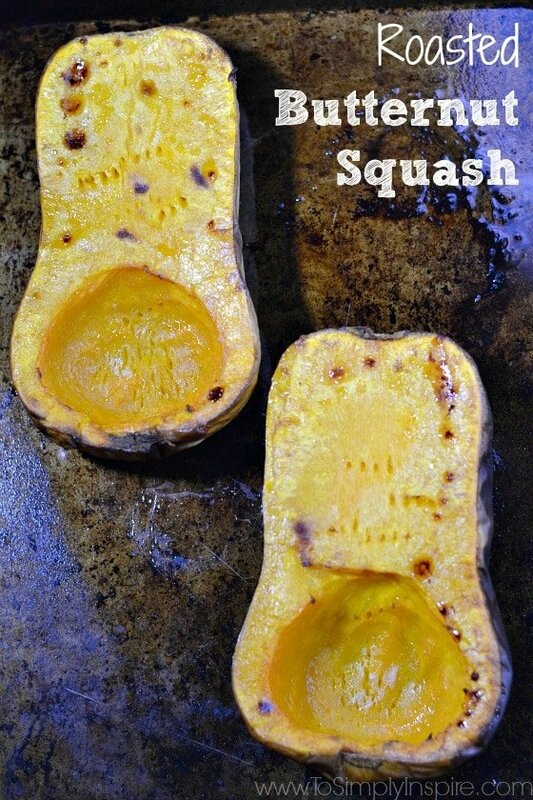 Great tutorial for Roasted Butternut Squash, we just love this squash roasted. Thanks so much for sharing with Full Plate Thursday and have a great week! We love butternut squash and that is pretty much how I cook it too. I’d like to invite you to link up to Frugal Friday. http://aspiredliving.net/2015/11/06/frugal-friday-week-3/ Have a great weekend. I have a butternut squash as well. lol! I have never tried it this way. Usually bake with butter and then sprinkle with a bit of brown sugar. Pinning. Thanks for sharing with SYC. What a great idea to add the spices (and the butter too!). 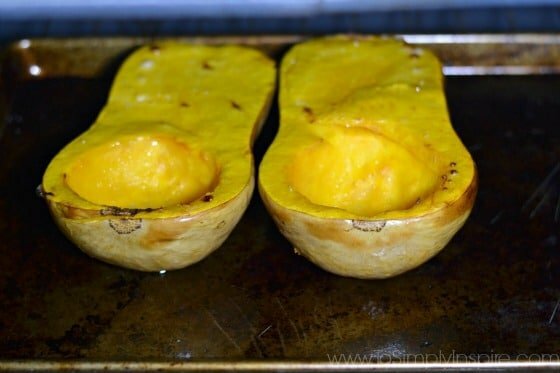 Your Roasted Butternut Squash looks delicious. Stumbled and yummed. Thank you for sharing with us at the Hearth and Soul Hop. I love this stuff. Sadly, my family does not. I love butternut squash! 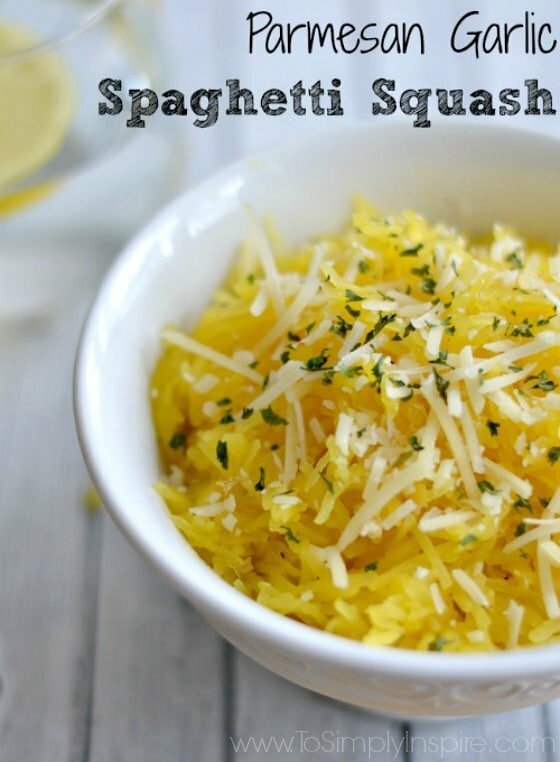 This recipe looks absolutely amazing, but I have to admit, the cutting/peeling process involved makes me eat butternut squash way less than I want to.